EX-TER-MIN-ATE! 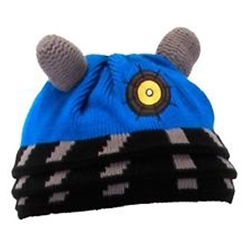 This knit acrylic beanie style hat has an embroidered applique eye stalk. The blue daleks are the non-commissioned officers of Skaro. One size fits most adults.